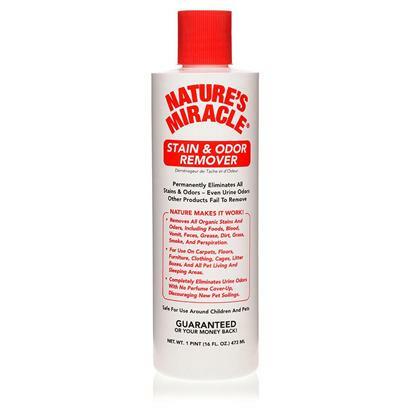 Natures Miracle Stain/Odor Remover, with its powerful enzymes, is able to neutralize and eliminate odors and stains permanently. Natures Miracle Stain/Odor Remover is safe to use around pets and children. Rated 4 out of 5 by 116 reviewers. Can you delete the fragrance? Expected less than a Miracle. Wow! This product is great!!! This stuff is a must! Nature's Miracle Saved my CAR!! Great product and works everytime. To the Rescue - AGAIN! I wish battery operated sprayer would work!!!!!! Best product for cat urine and feces messes! They go more than ever....! power sprayer stopped working after 20 minutes! Not Only for Pet Odors!!! Gets out that thrift store smell! WOW-Works great in carpet cleaning machine too! really does a great job! Works well with a puppy!